2019: Yes, I'm still here, don't worry! Just haven't got around to updating the site with anything new. I've been in the process of upgrading everything to a simple tag-based CMS I wrote, and this is taking far longer than expected. However, this year it'll definitely be up and running. 01/06/17: Updated my pages on the LM317 regulator with info on corresponding circuits using the LM337 negative regulator. See here and here. 21/02/17: I've at last made a video on ultrasonic transducers - how to measure them and design suitable horns. Check down the bottom of the page. 01/06/16: Big update! Linear power-supply potentiometer feedback, LM317 adjustable current source/regulator, AxiDraw laser cutting/light painting/phosphorescent vinyl, and drawing the Lorenz attractor on the AxiDraw, also using light painting and glow in the dark vinyl. 01/08/15: Powder coating capped starlock washers - a better example of the process. Hot-melt glue as a strain relief. 27/02/15: Celtic/Pictish circuit board coasters! 09/01/15: Accurately measuring lathe topslide angle. I've put the RSS feed back again since, according to my logs, quite a few people were using it after all! I've also added CSS and XSL stylesheets to the RSS file, following the fantastic guide here, to make the feed display nicely in a browser. 22/12/14: Gate drive transformer testing. I've ditched the RSS feed - you can use Twitter to keep up to date with what's new on the website. 11/04/14: Sidebar adverts have been removed since they had been killing the website visits. Apologies to anyone who was annoyed by them! 06/03/14: Added an RSS feed. Updates will now go on both the news page and the RSS feed. 13/01/14: How to grip threaded retaining rings and a tool for holding DC jacks while tightening. 20/12/13: Geiger-Müller tube detector circuit, nail clipper wire strippers. 06/12/13: X-ray of IKEA "wood"
20/11/13: Added a quick video of applying solder paste to the pick-and-place page, some links on the inductor tester page, and chopping up a halogen bulb to get the quartz tubing. 18/08/13: Film capacitor dissection, resonant charging equations, and focus stacking. 13/08/13: A better ICSP adapter and also a pogo-pin programming jig. Imitation Mitutoyo dial test indicator. 19/07/13: Put a "latest updates" scrollbox on the front page. Modified the stylesheet slightly so that the header and navigation bar are now hidden when you print the page. Added thumbnails for the different page categories. 07/06/13: Plastic optical fiber fittings, translating text files with Google Chrome, single file PHP gallery. 24/01/13: Added photo of using the magnetic arm to hold a magnifying lens. High-value resistor mixture. 23/01/13: Displaying monospaced code in the <pre> tag. Added list of ultrasonic suppliers to the ultrasonic driver page. 21/11/12: Basic calculator program and electric hotplate. 21/10/12: Adding a TTL output to the laser cutter. Video of glass lathe running added to the glass lathe page. 23/09/12: Warning about grounding laser diode added to UV laser diode page. 20/09/12: How adding noise and averaging can increase ADC resolution. Brandenburg flyback transformer. 09/09/12: Changed the appearance slightly (background, centered body, and rounded corners). PCB via size test. 31/08/12: Gamepad controller for mill. Links page. 22/08/12: UV laser diode. Myst game Selenitic Age mazerunner map. 13/08/12: Triggered spark gap. Added years to the category pages to sort things out a bit. More links and another knurl example on the rope knurling tool page. 06/07/12: Added where to get needles for the micro gas torch. 30/06/12: Large resistor and IC models. 10/06/12: Extruding solder wire with the hydraulic press. Taking shadow-free photos. 09/06/12: Useful suppliers spreadsheet. Example of knurled knob added to rope knurl page. Hydraulic press. 27/01/12: Shop added with my first product! 17/01/12: Propane burner furnace, making a split mould ring for a tile press, storage drawer retainers. 16/11/11: The photos of my jamjar Panaplex display were used in the countdown clock at the Nerd New Year event in Redwood City, CA. For more info, see http://www.phantomgalleries.com/SJ/2011/11/carter_needs_your_numbers.html and http://nerdnewyear.com/. 19/10/11: Current-sense resistor and potentiometer end-stop modification. 15/09/11: Machinable wax. Trick of using the carriage DRO to measure tailstock travel. Using bicycle sprockets. Cheap bevel/mitre gears. Air atomising nozzle. 22/08/11: Surface mount adapter boards, PowerPAD heatsink, surface mount component soldering arm, PCB drilling viewer, Excel interpolation wizard, aligning successive cuts with laser cutter. 21/07/11: Updated the page on solder glass to include dilatometry results and a full explanation of what's happening. 14/06/11: Laser wood burn examples. High-temperature strain patterns added to the solder glass page. 11/06/11: Test samples added to solder glass page. TIG welder arc lamp attachment. 10/06/11: Running a mercury arc lamp from a TIG welder and spark radiation detector. 08/06/11: More examples of electrolytic etching. Power ultrasonic driver and ultrasonic drilling. Americium 241 source holder. 27/05/11: TIG footswitch and timer. Two more pictures added to reed switch wires as glass-metal seals. 21/05/11: Webcam crosshairs/alignment software and hardware. Excellon to G-code converter. 03/05/11: Link to Adams & Chittenden's video of cutting glass tubing added to cutting glass tubing page. 27/04/11: Mirror of a page on a home-built TIG welder. Also electric melting furnace, Planté rheostatic machine and a dual-spindle glass lathe. 23/03/11: Electrolytic etching and a better 3V supply for my digital camera. 25/01/11: Added page on digital Kirlian photography. 21/12/10: Added the bit about my CO2 lasers from the Physics Dept. 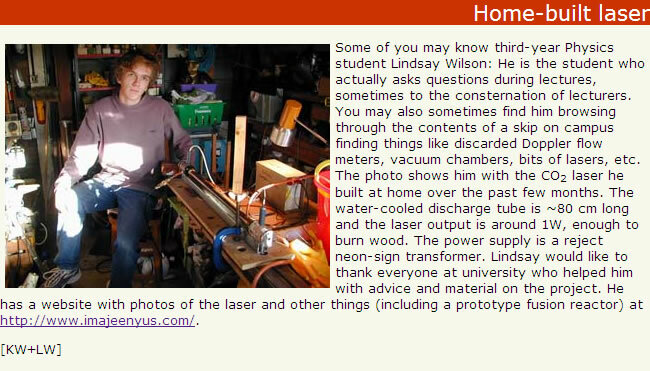 newsletter to the homebuilt CO2 lasers page. Added old page on the oscillating mercury drop. 03/12/10: Old pages on Zeeman effect, sodium street lamp and my very first ever webpage on a copper pipe spudgun. Also page on uranium marbles. 30/11/10: Uploaded old pages on the fusor and my first "neon" sign. 25/11/10: New page on the second Panaplex display! 17/11/10: Added a video to the Houskeeper seal page. New page on high-current feedthroughs. 30/10/10: Page on LTD Stirling engine. 27/10/10: Page on copper tubing pinch-off tool. 22/10/10: Added pages on micro gas torch and laser-cut solder paste stencil. 21/10/10: Uploaded the old pages on the CO2 laser cutter. The Panaplex display has been mentioned in the Make Magazine blog! 19/10/10: Pages on Panaplex display and LED mounted on conductive glass. 18/10/10: Page on Houskeeper Seals. 07/10/10: Added page on Nixie counter. 06/10/10: New site (v7) constructed using lots of nice CSS. Added page on AA battery eliminator. The dates on the various content in the categories are usually when it was first made/done/bought (usually). Some stuff may get put up months after it was done, in which case it might appear buried in the middle of the page somewhere. Sometimes, something new will be added to an old page. The News page has stuff ordered by the time which it was put on the site, and is the best way to see what's been happening recently. There are various VB6 programs listed on the site. To run these, you'll probably need the VB6 runtime files. See either http://support.microsoft.com/kb/290887 or download from my site directly at http://www.imajeenyus.com/VB6.0-KB290887-X86.exe.